"Net Neutrality" has won the day in a ground-breaking vote by the Federal Communications Commission. Liberals are claiming a great victory for free speech. Conservatives and libertarians are worried that government control of broadband providers will lead to exactly the opposite. The astrology for the ruling is very striking and a bit unsettling. I used the 1pm time of the HuffPo article linked above: the actual ruling was probably shortly before that. Libertarian: Pallas contraparallel Sun and ruled by Jupiter which is opposite Mercury. Authoritarian: Jupiter, ruler of Pallas, quincunx Pluto and trine South Node. This is a very mixed signature, suggesting the potential for wrongdoing but also the possibility that not everything that comes out of the ruling will be destructive. Collectivist: Venus conjunct South Node; Sun (possible Second House ruler) conjunct Neptune. The ruling is by definition a "softening" of the private property rights of the broadband providers. It tells the providers that "your tubes" (to use Ted Stevens' analogy for the internet) are now "everyone's tubes" or "the government's tubes". 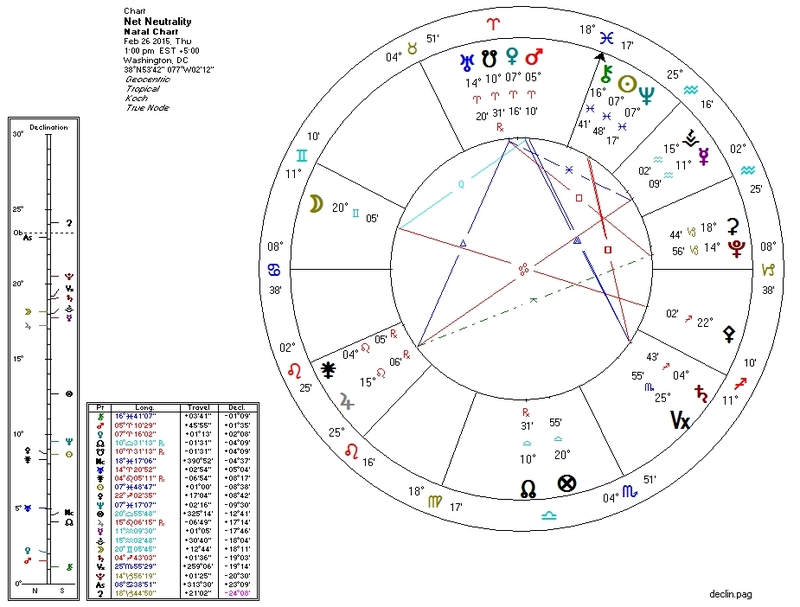 South Node conjunct Uranus, Venus, and Mars in Aries: the loss of technological innovation, financial value, and autonomy? This is truly frightening. Sun conjunct Neptune, square Saturn: deception, delusion, back-room deals involving the government? The dissolution and restriction of self-expression? Jupiter in Leo quincunx Pluto in Capricorn: public expression under threat of death by authority? Moon quindecile Saturn: an authoritarian clampdown on the public? Moon opposite Pallas: a call to arms? For whom? Moon parallel Jupiter, contraparallel Mercury: public sentiment leading to pressure against free communication? Mercury in Aquarius trine North Node: a lone indicator of increased free-flowing information? The transits against the US chart are also noteworthy. Maybe we'll get to those. February 27, 2015 at 3:35 PM http://teapartyeconomist.com/2015/02/27/the-fcc-is-toothless-and-feckless/ Gary North is not afraid of the regulators.